As you can see, I held one out on you! I know. I know. It couldn’t be helped. I just can’t get enough of those beautiful Lions. Apparently, I am not alone. Last week’s post “Love Lies Within A Jungle”, received one of the highest number of visitors to this site. It seems that we all love animals! So I thought, hmm, that’s interesting. Perhaps I should give you a glance beyond the jungle this week and expose the person who is responsible for those amazing pictures—wildlife photographer Suzi Eszterhas. Suzi Eszterhas lives in the San Francisco bay area, but because she spends nine months out the the year away shooting taking photos of a wide variety of animals in the wild, I guess you could say her real home is Africa. In recent years, she has specialized in documenting family life of endangered species and has become well known for her unprecedented work with newborn animals. Her photographs are published in books, magazines and newspapers all over the world, including the front covers of “Time” and the “Smithsonian”. As you can imagine, Suzi has won many awards, including those from the National Wildlife Federation, Nature’s Best and Wildlife Photographer of the Year. Although she primarily works in Africa, she has also undertaken commissions and led photography tours and workshops in the Antarctica, the Arctic, Alaska and Montana. Well, as you can see, just about everywhere. Suzi Eszterhas is a fellow writer. Isn’t that cool? Who knew? But before I get into that, I just had to ask…What attracted Susi to become a wildlife photographer? Was it her love of nature? Her passion for photography? Or was her childhood love of animals? And when we study each picture on this page, we can see Suzi’s passion for that special moment shining right on through. As I mentioned above, Suzi Eszterhas is also a writer and she has produced a new series of children’s books that follow the lives of baby animals from their birth to adulthood as they grow up in the wild. I had originally contacted her, after sighting that gorgeous picture of the father lion and his cub on the internet, wanting her permission to publish it on my blog. But after our correspondence by email, Suzi admitted that she had released these fabulous books. And the name of this series is: “Eye on the Wild”. These beautifully photographed books are for young children ages 4-7. They show all aspects of the animal’s life in the wild, with close-up pictures of the family group in its natural habitat. The books also include conservation information and useful websites. If you have any young children or grandchild, you’ll want to be sure to check them out. They are so adorable. What child or adult for that matter wouldn’t want to read one of these books! So what do you think? Which one is your favorite among the animal kingdom? Do you have any animals at home? Do you love photography? Have you ever contemplated going on a Wildlife Safari? This entry was posted in Blog Post and tagged Africa, Amazon, Eye On The Wild, Karen McFarland, Montana, National Wildlife Conservation, Smithsonian, Suzi Eszterhas, Time, Wildlife Photographer on September 12, 2012 by Karen. What a wonderful post, Karen. Thanks for featuring Suzi’s amazing, beautiful photos. Her children’s book series looks awesome. I know Punkin would love all her animal books. I bet they sell well. Karen, your blog posts rock, you know that? Melt me already! I love animals so much. Suzie truly captures their awesomeness. 🙂 It’s tough to pick a favorite animal, but I tigers, elephants, bull dogs and birds rank high on my list. Thanks for the lovely post! Beautiful. thanks for introducing her to us. What great photos, Karen. Thanks so much for sharing these. Wonderful! Awww! Someone is going to be making We Bought A Zoo 2…staring me. I love these pictures! Beautiful pictures, Karen. Suzy has a real lovely eye for taking pictures of these wild creatures. I would love to go on an African safari and experience this in person. Lions, cheetahs, gorillas! Oh, my! How can I choose just one? All the big cats, gorillas and chimps – heck — all wildlife, especially the babies, have been favorites of mine since I was very young. And I LOVE Suzie’s books. What incredible photos. 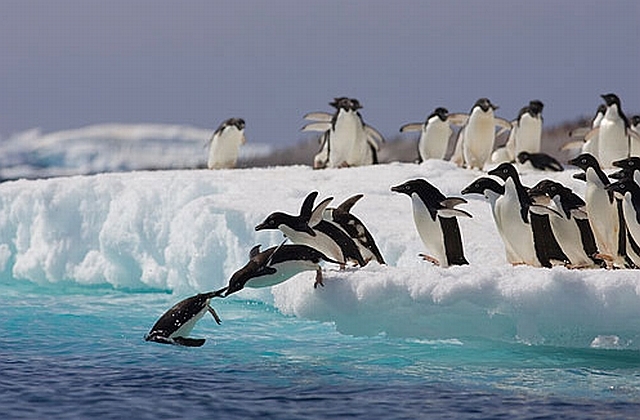 I think the one of the penguins is my favorite (I love penguins). And I think it’s awesome you got a chance to talk to the photographer and ask her about her process. As something of a photographer myself, I always appreciate finding out why people pursue the subjects they do. Great post! Oh, I’m definitely checking out those books for my 6 yr. old boys! I’m sure the images in them are priceless. shannon esposito recently posted..A Grand Adventure! 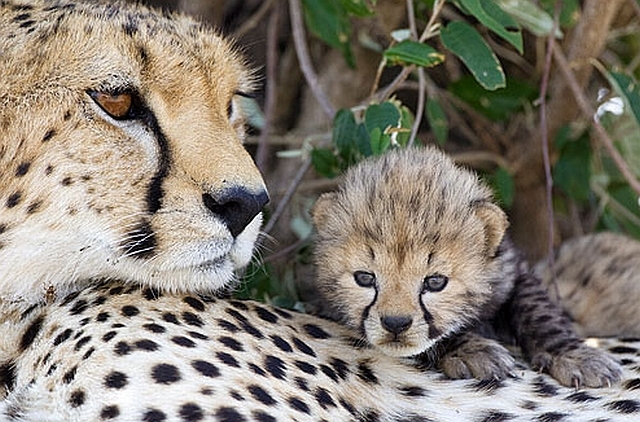 Love the new lion-and-cub pic and the shot of the diving penguins, but that baby cheetah stole my heart. Beautiful photos! I can’t pick just one. Love looking at animal photos and programs. The last documentary I saw, Frozen Planet was amazing. I did love those penguins! I’m going to have to go with the wily octopus as my favorite animal. Or maybe it’s the owl. Or is it the cat? So many awesome animals out there, it’s hard to choose. Actually, I believe the octopus story was Laird Sapir’s idea. But I might have been responsible for generating interested in octopoids in general because of a couple of my early blog posts. And I wouldn’t say I’m into photography, but I discovered how fun it can be when I took a camera on my first trip to another country. I’ve developed more of an appreciation for photography since then. As writers we try to catch that special moment too and it’s wonderful when it works. Suzie’s photos are breathtaking. The lion and cub may still be my favorite but each one of these pictures brings up such strong emotion. What a talent Suzie has. All of Suzi’s photos are extraordinary. The little books are so cute. That is so cool that she’s a writer as well as photographer. My favorite? I don’t know. 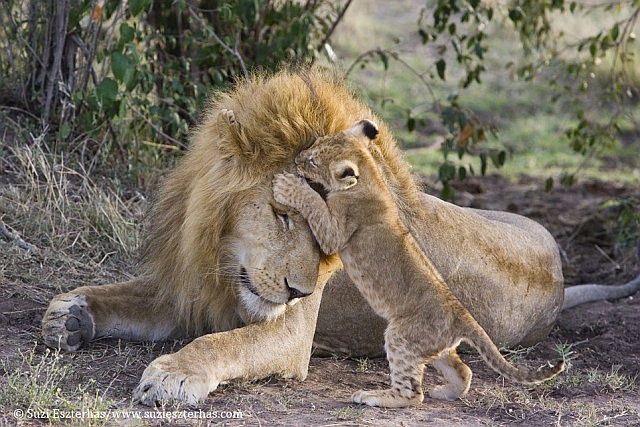 Probably the one where the lion met his son for the first time (on your first post). That just had so much emotion and power in it. I also like the jaguars. And the penguins. Don’t make me pick! I love them all. Such beautiful photographs and I know there is a story to be told with each of them! Great introduction to an amazing photographer! Wow, Karen, Suzie’s photos are extraordinary. Loved them all. Thanks so much for introducing us to another gifted artist and animal lover. Prudence MacLeod recently posted..Free books and Bling! Squeeeee! Penguins!!! They are my favorite! In addition to the two Rottweilers, we also have the gerbils and a turtle. These books look adorable – some of my coworkers have young kids; I’m pulling this up at lunch to show them.